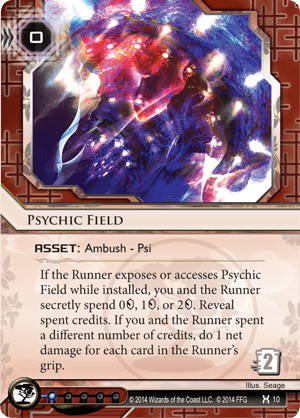 If the Runner exposes or accesses Psychic Field while installed, you and the Runner secretly spend 0credit, 1credit, or 2credit. Reveal spent credits. If you and the Runner spent a different number of credits, do 1 net damage for each card in the Runner's grip. Many people despise it, but I really like this card. It is basically a Komainu taken trap form, activated with a Psi game, giving you about 67% chance of working. Doesn't work from R&D, neither from HQ or Archives, only installed - so, the usefulness of this there toy is mostly limited. Or is it? Obvious answer - depends on the meta. If your locals play a lot of exposure gadgetry, this will induce rage and pain harder than an easily countered Junebug. Psychic field doesn't need to be advanced in order to work and has a trashing cost of 2, which may or may not help if accessed from somewhere else than the remote server - depends on circumstances, but it is better than whopping 0 of its rival and somehow justifies that you have to spend additional credits in order to fire it. Contrary to Junebug, Psychic Field won't flatline a runner, but you can easily do this yourself with a Ronin, Neural EMP. What it will do instead is set him (or her) back a long friggin' way. If I may make a suggestion? Toss it in, just one copy, if you will. See what it does. Maybe not in the first match, maybe not in the tenth, but at some point, it will fire. And you will laugh. And they will cry. Now, if there was a card that would let you expose an installed card to the runner... Maybe someday it will - and then Jinteki will break the game to pieces. EDIT: There you go! 419: The Amoral Scammer hates this card with perfect hatred. You've got a good chance of being just a won psi-game from an easy victory, provided you can follow up with Neural EMP or Ronin. This card is all about making the runner respect placing multiple cards face down upon the field without ice at the same time. Is there an agenda?, are they all agendas? is there a trap?, are they all traps? which one is the agenda and which one is a trap? Making the runner think is the greatest strength of jinteki. One hit and failed psi game later and all of a sudden they find themse;ves with their entire hand being flushed. Psychic field however, is different than other trap assets. It really demands complimentary traps to make it worth while so as to keep the runner guessing. If you're playing Jintek all you need is 1 snare in deck, 1 snare in hand, 3 breached dome protecting archives and now they have to respect running anywhere.